Attracting birds to your yard means not only enjoying their pretty plumage and melodious songs, but also their pest control abilities. Birds consume primarily insects, especially when they are nesting. Why not invite these tiny predators to your gardens? Birds require food, water, shelter, and safe nesting sites. There are many ways to feed birds, but to create a lasting haven, try creating a landscape that feeds them year-round. Each species of bird has its own specific instinctive needs, but in general include plants that flower and attract insects. Birds also enjoy fruits, seeds, and berries. The more diverse types of food you provide, the more species of birds you will attract. Also, think about having plants that flower and form seeds or fruits at different times of the year. For example, coneflower sets seeds in late summer and is beloved by goldfinches. If you allow the flowers to set seed, finches will seek them out. The new cultivars of crabapples have small, hard berries that persist through winter to feed birds in early spring when there are few options. 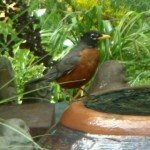 Birdbaths are a popular way to encourage birds to visit your garden. Birds love clean, fresh water year round, so we recommend checking your birdbath daily and emptying if not every day, every few days to discourage mosquito larvae. Make sure to clean them on a regular basis to prevent disease and pests. Use a 10% bleach solution to control pests or diseases. Many birds enjoy running water, so consider adding a fountain, bubbler or pump that moves water. Use a deicer in bird baths during the winter. Offering hiding places and nesting sites will encourage birds to make your yard their home. Many birds nest between five and eight feet above the ground. Consider adding dense shrubs, evergreens and trees for birds to hide and build nests. A mix of open areas and denser plantings creates habitat for a wider range of species. Provide some leaves and brush for those birds that hunt for insects hiding in the detritus. Birds play an important role in the ecosystem, yet worldwide habitat loss has put more pressure than ever on bird populations. Remember the key: the more varied your landscape, the more varied the species of birds you’ll attract. The Growing Place staff can provide you with advice for making your yard, whether large or small, a beautiful haven filled with diverse and abundant wildlife.